Meal Planning: List your meals for each day of the week. Water and Exercise: Track how much water you are drinking and list your exercise routine each day. Shopping List: List important items you need to remember. To Do List: List tasks you want to complete during the week. Daily Goals: Identify your two most important goals each day. Budget tracker: Track your budget for weekly variable expenses like groceries (see how below). 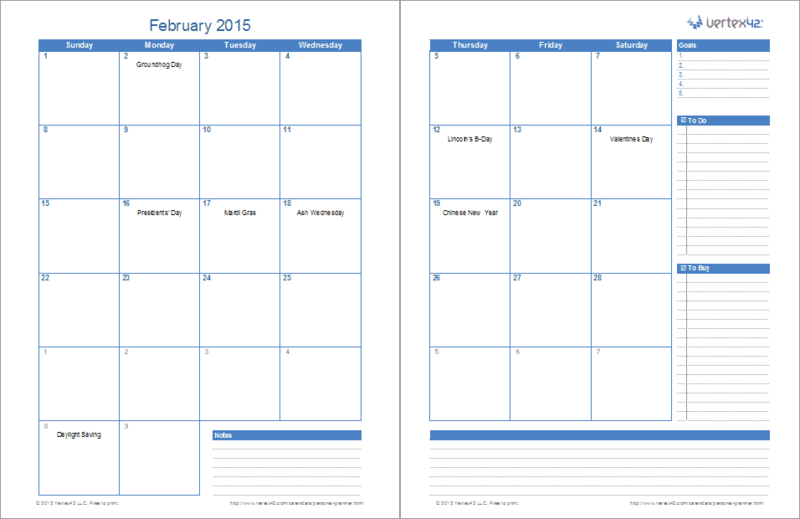 Monthly calendars: Use the mini monthly calendars at the top for a convenient reference. Appointments: Most planners use up a lot of room for appointments, but if you are so busy you need to list more than 5 appointments, you'll probably be using a phone, so I kept this section small to make room for everything else. 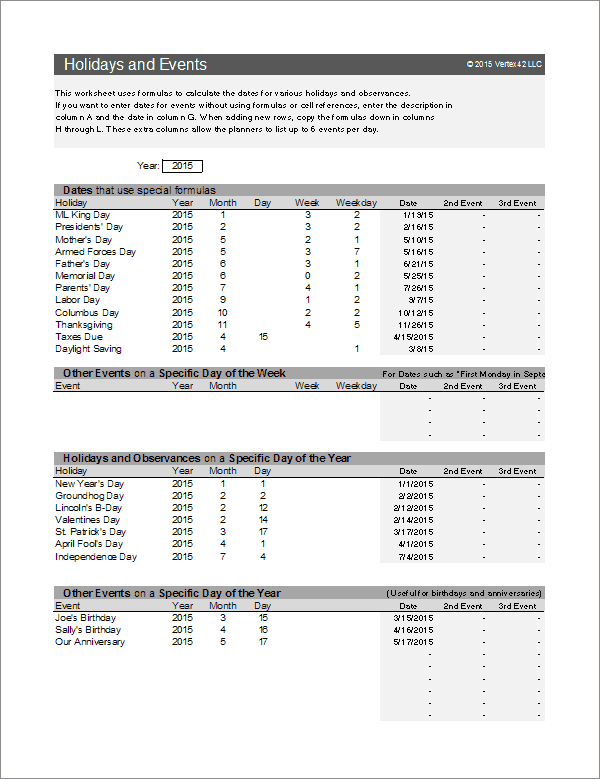 Holidays and Events: The spreadsheet is already populated with many US holidays and observances, but you can also list your recurring annual events like birthdays and anniversaries. No subscription fee. Immediate download after a one-time payment. Try it out! If you don't think it was worth the cost, I will refund your purchase. 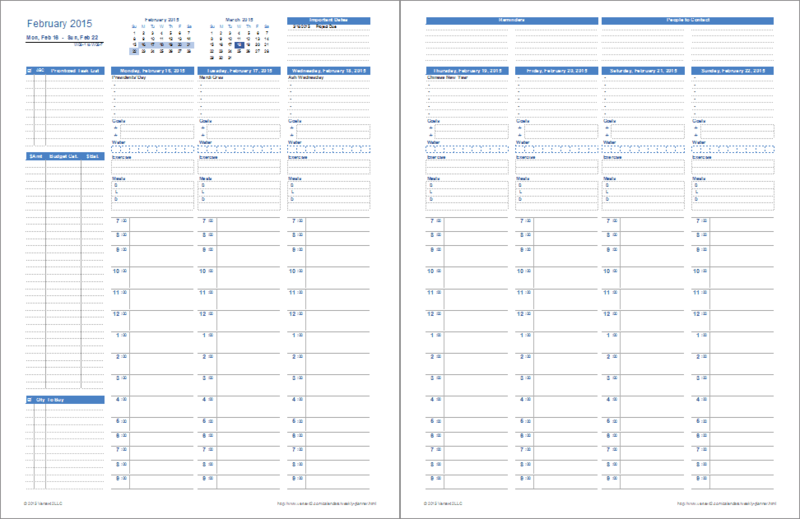 In addition to the single-page weekly personal planner, this spreadsheet contains the following printable planner designs (on separate worksheet tabs). Each of these planners reference the same list of holidays and events (which is why they are all included in the same workbook). 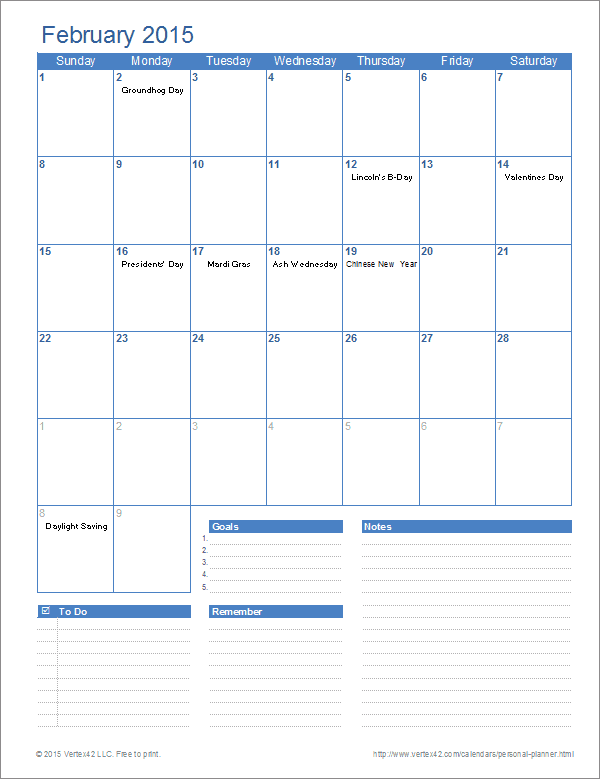 The monthly planners are basically the same as my Monthly Planner Template, except that the original monthly planners do not display holidays and events automatically. 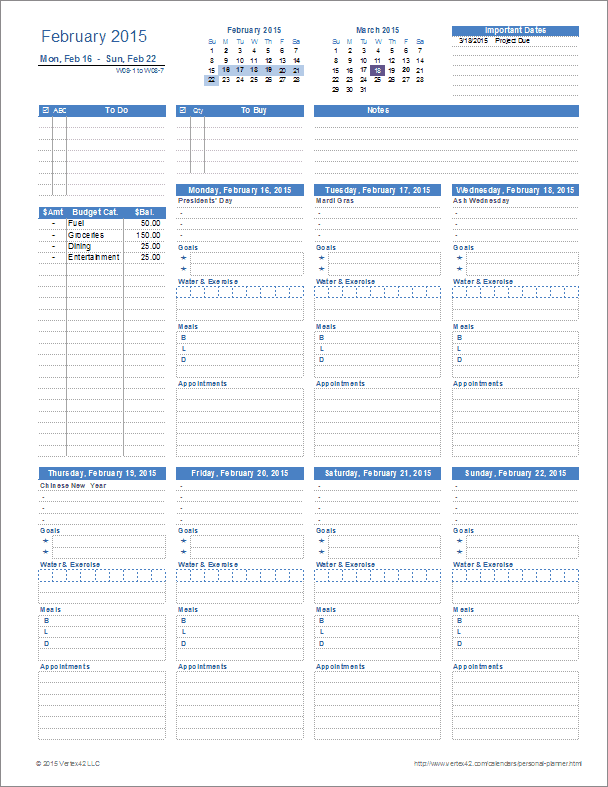 The daily version is similar to my Daily Planner Template, except that it includes sections for meals, exercise, and goals. Under each day of the week is a spot for listing up to 4 holidays and events. The spreadsheet automatically lists these by referencing the list in the Events worksheet (shown in the screenshot to the left). You can delete holidays and events from the list as needed, and add your own. For example, a common thing people like to do is list birthdays and anniversaries. Each of the planners in this spreadsheet (both the weekly and monthly planners) reference the same list of holidays and events. 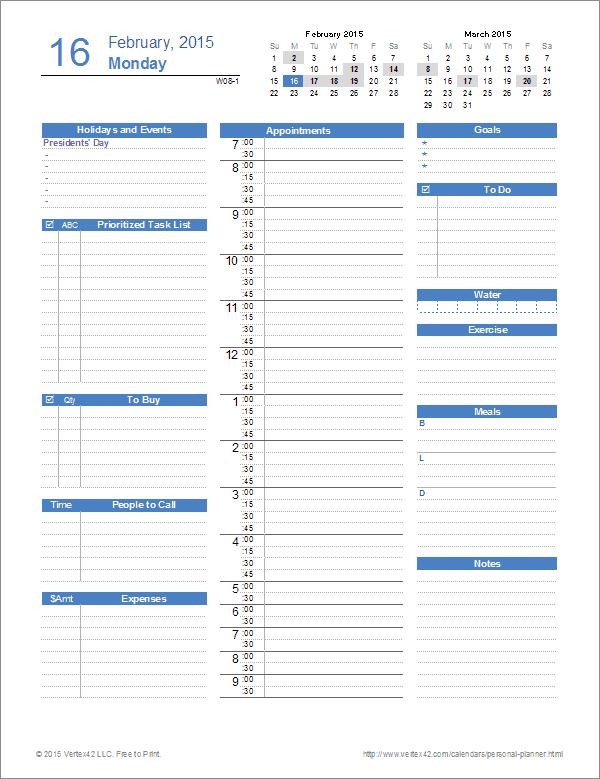 The template was designed so that you can edit the start date and then print a single planner page. This is the simplest approach for people not familiar with Excel. If you want to print multiple sheets at a time, you can duplicate the worksheet (right-click on the worksheet tab and go to "Move or Copy"), edit the dates at the top of each worksheet, select all the worksheets you want to print (by holding down the CTRL key as you select the worksheet tabs), and then print them all at once. The budget section is a unique feature in the weekly planner. It is typical for a planner to have a place for you to list expenses. You can do that with this personal planner as well, but the idea of the budget section is to not just list your expenses. You can also use it keep track of how much money you have left in a few critical variable expense categories, such as groceries and entertainment. At the beginning of the week, list how much money you have to spend in the categories you are wanting to track (by entering the amount in the Balance column). Then, after you go to the store, enter the Amount spent on the left and then update the Balance for that category. This isn't meant to take the place of a complete budget planner, but it can help you control spending within a few key categories. Tired of Blue? Like almost all of our other templates, this spreadsheet is theme-enabled, meaning that it uses theme colors and fonts that you can easily change by going to Page Layout > Themes and choosing a different set of colors or fonts.